Guernsey FC manager Tony Vance says keeping the club's Isthmian League status would be a great achievement. The islanders are four points above Greenwich Borough, who occupy the relegation place in the league's South East Division, and have a game in hand. 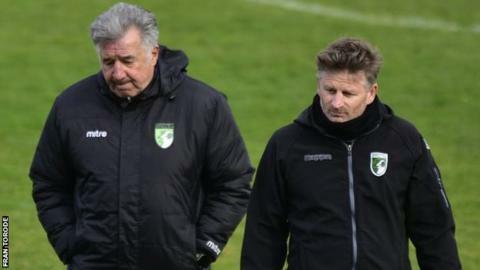 "Something we don't get to experience in Guernsey is a relegation battle," Vance told BBC Radio Guernsey. "It's going to really define the players if they can achieve the status of playing in this league again." Vance's side have been in the eighth tier of English football for five seasons, but struggled last term as they finished 21st, but avoided relegation due to a restructure in the league system. The Green Lions drew 2-2 with fellow strugglers Faversham Town on Saturday and have six games to go including a key home fixture with Greenwich Borough on Sunday, 14 April. "I've given the players a target of some points we need to try and achieve and that's another one that we've added onto the list," added Vance. "We have six games, one game in hand on Faversham, but we're looking behind us really in terms of the team below us. "They're signing players for fun to try and get out of it and that's the situation we face in this league. "We know what we're up against to a certain degree. We've got to use heart and tactical and desire and see if that can be enough."